A terror attack in Paris has hit France like a seismic shock only three days before voting begins in a presidential election where anything seems possible, even the end of the European Union. A gunman shot three policemen on Champs-Elysées Thursday evening, killing one and wounding two, before being shot dead. The government says the attack was “of a terrorist nature.” The shooting took place as the candidates were just going on the air to make their final televised appeal to voters. Far-right populist Marine Le Pen and neophyte centrist Emmanuel Macron are slight favorites in the April 23 first-round vote to ultimately elect a French president. Meanwhile, the world is nervously awaiting a possible “Frexit” — French withdrawal from the EU — after the UK’s “Leave” vote on Brexit and Donald Trump’s election in the United States. Ahead of the attack, France’s four top presidential candidates (out of a packed field of 11) were polling within a couple of percentage points of each other for the first-round lead — almost within the margin of error. Any two of them could be in the expected runoff on May 7. Not a single poll shows Le Pen winning if she makes it to the final round. But that doesn’t mean it can’t happen. 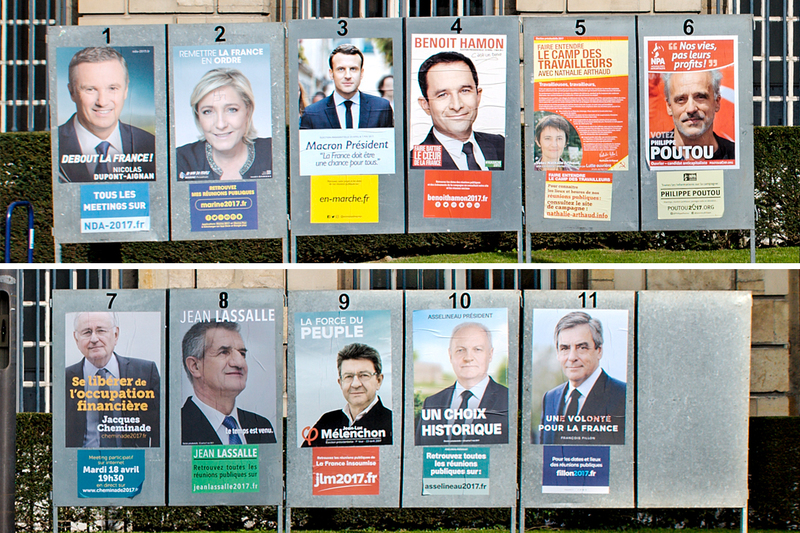 In this unprecedented election, one-third of French voters are undecided and an equal number say they might not bother to vote. The global media, long fascinated with Marine Le Pen — France’s “Trump” — is comparing the three other frontrunners to a young Tony Blair (Emmanuel Macron), Margaret Thatcher (François Fillon) and Hugo Chavez (Jean-Luc Mélenchon). Conservative François Fillon has made a remarkable comeback and is still in the running despite being under investigation for a fake jobs scandal involving his family. Headlines declaring that Le Pen will be “stopped” or “crushed” in the second round are overlooking the new political reality in France. A second-place finish will push her once-taboo National Front party, with its neo-fascist and racist roots, deeper into the mainstream. Marine Le Pen would need over 50% of the vote to win. Unlike in the USA, a French candidate cannot become president with a minority of the popular vote, (e.g., George W. Bush in 2000 and Donald Trump in 2016). Since 2002, France’s political establishment — the so-called Republican Front — has used tactical voting to keep Le Pen’s party out of power. That’s why, even though her National Front party (FN) won the first round in six of the country’s 13 regional elections in 2015, it failed to win the second round in a single one. The UK betting markets give her roughly a one in three chance of becoming president. At one point the Swiss bank UBS rated her chances as high as 40%. Win or lose, a second-round place in France’s presidential election would represent a crowning achievement for Le Pen in her 15-year struggle to build and sugarcoat an ultra-right insurgency. The next milestone will be the June parliamentary elections with the National Front hoping to pick up 60 to 80 seats. As the leader of a large parliamentary bloc in opposition to the government, Le Pen will be in a stronger position than ever to shape France’s future. “Rage has made a comeback,” writes Jean-Luc Mélenchon in his blog. He was meant to crash out in the first round, a “magnificent loser” who gives a good speech. Now it seems he could conceivably squeeze into the final round by taking votes from fading Socialist candidate Benoit Hamon. According to the polls, he would comfortably beat Le Pen in a runoff. The ex-Trotskyist was rated the most convincing candidate in the second televised debate. His campaign website has had the most hits of any candidate. A populist on the opposite end of the political spectrum from Le Pen, Mélenchon shares a few of the same ideas such as quitting NATO and the euro. “We must break with this corrupt world,” he says when talking about France’s membership in the EU. His platform calls for a 20% increase in the minimum wage and a 90% tax on the rich. He is the only frontrunner to have made homelessness a campaign issue. The French Left may be splintered beyond hope but Mélenchon’s popularity is a reminder of its latent strength. Mélenchon and Hamon might come to regret not running on one ticket. It says a lot about the state of French politics that the victory of an establishment candidate would be a shock event. Alone among frontrunners, François Fillon has the backing of a mainstream party, the center-right Les Républicans. He promises to defend traditional family values and France’s Catholic roots and to apply “Thatcherite” shock therapy to the economy. Fillon can sound a lot like Le Pen at times. The unabashed right-winger has honed his appeal to the National Front electorate. Rejecting political correctness and the idea that France is a multicultural society, he calls for rewriting the French Constitution to make it easier to restrict immigration. On his way to becoming France’s next president Fillon was overtaken by “Penelopegate.” A French judge is investigating allegations Fillon paid his British wife and their teenage children almost a million euros in taxpayers’ money for made-up jobs. 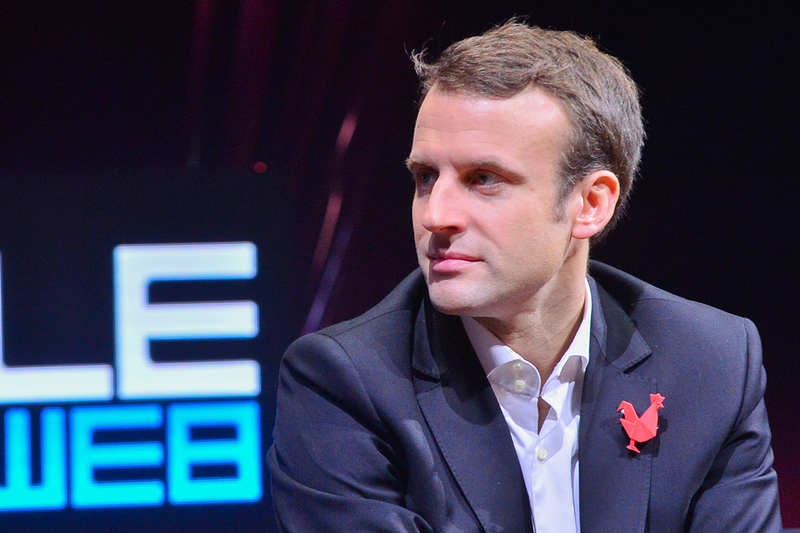 Emmanuel Macron is so strikingly unconventional a candidate for president he has been called a “political UFO.” A former investment banker, he has never been elected to public office. The press fawns on him and seems more obsessed with his happy marriage to a woman 24 years his senior (the Trump-Melania gap) than his platform. The political newbie is not even 40. Claiming to be “neither left, neither right,” Macron promises to make France great again by embracing globalization rather than closing its borders. Macron markets himself as a complete outsider — his campaign book is titled “Révolution” — but his program adheres in fundamental ways to the legacy of Socialist President Francois Hollande. He served in a government, as an economic adviser and later as minister of the economy, that prolonged France’s “lost decade” of job losses, declining competitiveness and soaring public debt. Employment in France, as in much of Europe, has never recovered from the financial crisis of 2008. Piketty points out that, as a member of the euro, France is not able to run its own independent economic policies. Macron remains ideologically committed to the EU fiscal treaty to control eurozone budgets (and punish rule-breakers). The austerity overkill is creating a generation without jobs across Europe. Despite France’s populist sound and the fury and the near collapse of its two mainstream parties, the electoral outcome might be more of the same — if it takes the form of a Fillon or Macron presidency. Whoever wins, France will remain on edge. 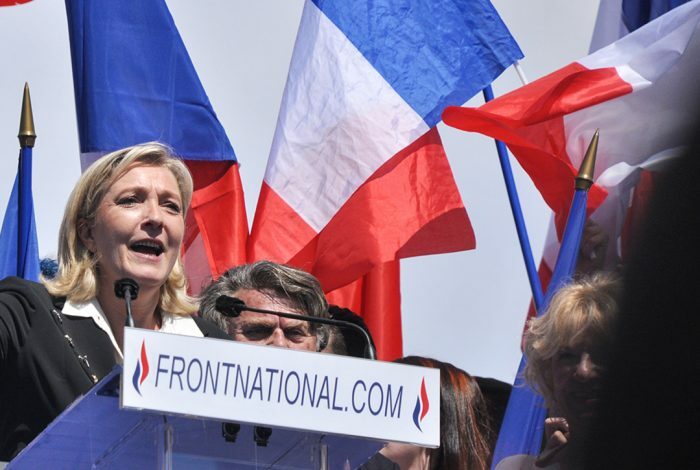 Le Pen’s anti-Europe, anti-immigration and anti-Islam program has never been more influential. Pollsters and sociologists say her National Front party is radicalizing a growing percentage of French youth. Like Geert Wilders in the Netherlands, the National Front is playing the long game: shifting the boundaries of mainstream politics ever further to the right. Marine Le Pen, a youthful 48, is now a contender for “most famous French woman on the planet.” If she doesn’t win, she will be back with a vengeance in the presidential race of 2022.